Maravilla is a 33.7-acre gated community located directly across the street from its two and a half acres of deeded, unspoiled beach. Maravilla is a wonderful resort with guests who return year after year. With family friendly grounds and a Destin vacation that won’t break the bank, guest love the convenient location (midway between Destin Commons and Silver Sands Outlet) with a access point from HWY 98 as well as Scenic Gulf Drive. 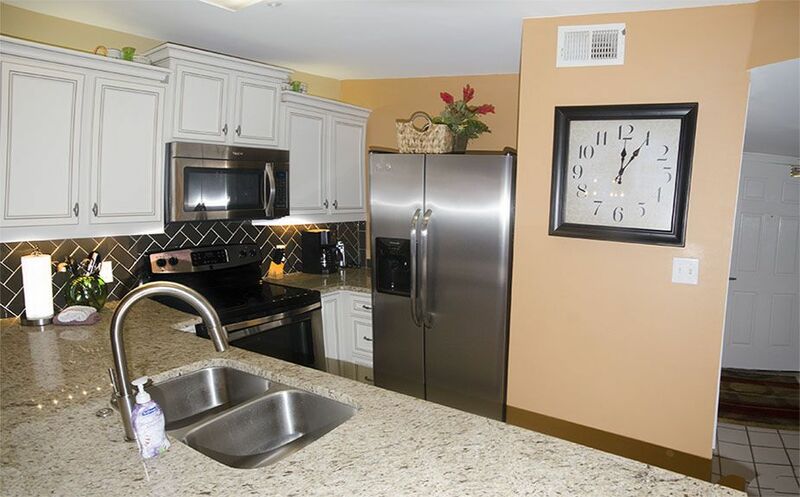 This two bedroom, condominium is located on the first floor in Building 2 ! This unit is almost directly across from the entrance to the beach and incredibly convenient. This is one of our many Maravilla 2 bedroom units, check our other listings on VRBO and Homeaway for other options. The unit offers free wifi / high speed internet, large flat screen TV, a private master suite with king-size bed and adjoining full bath, full kitchen, breakfast bar and large living room with queen-size sofa sleeper. The second bedroom has a lower bunk with a full bed and a upper bunk with a twin bed. This unit is perfect for a family with kids. We have 2 beach chairs and an umbrella in the condo for your use. Maravilla has two swimming pools (one heated with a whirlpool spa), two tennis courts, shuffleboard, barbecue, clubhouse, game room, and exercise room... all for your enjoyment! You are within walking distance of great restaurants and a short drive to theSilver Sands Outlet Mall, Destin Commons Shopping Mall, and Big Kahunas waterpark. Please note: All of our properties do require a Saturday-Saturday Stay during Spring Summer and Fall unless there is last minute availability. Beach Condos In Destin is a family owned and operated rental management company that has been managing rental homes and condominiums in Destin, Florida since 2005.Beach Condos in Destin began by managing seven rental properties owned in the Miramar Beach area of Destin. Upon hearing of our success with these properties, our friends began asking us to manage their rentals as well. Since 2005, word of mouth referrals have helped us grow into now managing 52 properties in the Destin area. Maravilla 2105 is so conveniently located. In building 2 of Maravilla you do have a nice view of the water. Additionally you have ease of access to the beach access and the pool. In the building facing the street and the gulf. We do offer travel insurance for a additional &% of the total if you want to add that on. Only issue was cleanliness of unit. Not as clean as in the past. Only issue is that unit not as clean as in the past. Baseboards tile floors. Entry door molding looked like Someone tried to break in. This is our 2nd stay in this unit. Love the location!! We do have miles of walking paths which many of our guests enjoy with their pet. The pet area is adequate for most people and their pets. We do not have an off leash dog park at Maravilla or any of the other vacation properties in the area. The beach is not pet friendly unless you are a permanent resident and have a permit during limited hours. Most of our guests traveling with their pet enjoy walking in the permitted areas on leash. Of course, it is always required to pick up after your pet. The Destin Dog Park is relatively close (4-5 miles away) if you need an off leash park. Great location for beach and pool access. The condo at Maravilla was a great location, steps away from the beach. Clean, enough room, updated, and good proximity to shopping and restaurants. I was there with my wife and our two young sons (7; 4). The condo was base level. 'Neighbors` above seemed to be laying a new floor (only thing that could explain that much noise) from 6 am until midnight each day for a week. We had multiple people looking in glass sliding doors throuhout the week at all hours. I live in Detroit; not something we are comfortable with. This is obviously out of the leasing company`s control but something to be mindful of if anticipating a family friendly vacation. I had anticipated a more laid back experience (eg Marco Island). We got more of a springbreak atmosphere. That said, beaches and water are absolutely beautiful. A future trip/ next trip to Destin/Miramar Beach will happen, but need to research best months for family atmosphere. Condo was perfect location. Loved being close to beach and pool. The only reason why I gave this condo 4 stars instead of 5 was because the mattress in master needs replaced. Also the furnishings are in need of updating compared to others in this complex. With that being said... we would stay here again do to the convenience and location. This unit is so uniquely located on the first floor in building 2 with convenient access from the patio to the beach access and to the pool. Incredibly convenient for walking pets and for loading and unloading to the beach each day.